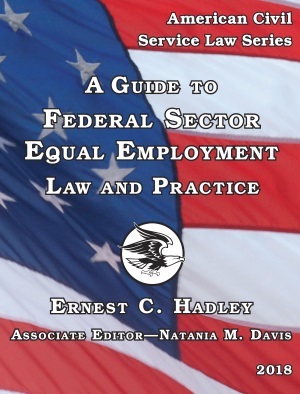 Written by Ernie Hadley, a practitioner before the Equal Employment Opportunity Commission for more than 25 years and lecturer on EEO practice, and with his Associate Editor, Natania M. Davis, the EEO Guide is the standard reference on federal sector EEO law and its appellate organization, the Office of Federal Operations. This treatise provides practice guidance and analyses of federal sector EEOC and court decisions, statutes regulations, policies, guidance, and practical advice. It is annually updated and extends back to 1978. New easier to read, two column format: view sample pages. With analysis of 2017 and early 2018 decisions of the EEOC and OFO and major developments during 2017. The EEO Guide is a component of the American Civil Service Law Series. Also included are a detailed table of contents, case table, and index. This text is also available on a CD-ROM as a .pdf file that provides many useful features. Hyperlinks allow the reader to move quickly+ between the Table of Contents and Index entries and the corresponding portions of the text. Internal hyperlinks serve as a cross-reference feature within the text. Major cases are linked to internet cites so that the entire case can be viewed.